With Christmas and the holiday season just a few short weeks away, now can be an excellent time to capitalise on the property market to snag yourself a property as many vendors are motivated by the end of year deadline. This month we look at five reasons why buying a property can be the ultimate gift that keeps on giving in addition to inspiring thoughts and case studies. 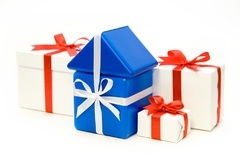 With Christmas just around the corner and our thoughts turning to holidays and gift giving, let’s take a look at five reasons why buying a property can be the ultimate gift that keeps on giving. least a full property cycle (i.e. 7-10 years). When you structure your property investments the right way, you have the ability to make money literally while you sleep! I’m not saying property investment is a totally set and forget investment - you still need to maintain the property, manage your property managers, regularly review the rent, bank loans and monitor its performance. But once it’s purchased, there is not a massive time commitment to manage a portfolio. It’s there ticking away in the background generating you good yields (possibly positive cash flow) and capital growth. If you’ve got property worth $600k today and it generates 7% growth pa, that’s a $42,000 gift each year (but note some years would be lower or higher than this average)! The ability to borrow at least 80% LVR for property assets is one the great benefits of investing. This leverage gives you the ability to recycle your existing equity and borrow more to increase the size of your portfolio. Lending for shares is typically a much lower LVR at around 50% to 60% and this also runs the risk of a margin call. The banks love property assets for lending and the mortgage market is always in a stage of change – so use a finance broker to help you source the best loan. Being able to leverage your borrowing gives you the ability to fast-track your property goals - particularly if you are in the accumulation phase of life (20 to 60 years). With this leverage you can select the best investment strategy that will work for your stage of life – capital growth, positive cash flow, value adding or a combination of all three! Some of us worry more than others about the future. Building a property portfolio does come with some risks – the risk of market downturn, economic crisis, over-leverage, unemployment etc. Some risks can easily be managed – e.g. having readily transferable skills in case you are made redundant, but other market risks cannot be as easily managed. However, property as an asset class tends to be far more stable and resilient than shares and rides out the economic storms very well. The Australian property market is worth over $5 trillion dollars compared to over $2 trillion in the equities market. During the last GFC, Australian property went down in some areas 5% to 10% but then quickly rebounded in the subsequent years. Property tends to be more forgiving over time – and far more stable in value. Studies have shown that the more people earn the more they spend (but this does not necessarily make them wealthy). Investing in property creates a forced savings program so that instead of spending more money on the latest gadgets, cars and TVs, you “invest” the money into property assets. Property investing keeps you on track and this financial discipline means you’ll have lot more money for retirement and other purposes in 20 years’ time. Understanding the numbers with property investment will give you a lot more control over your finances. The ultimate reason to build a property portfolio is to create wealth that gives you more choices in life – to provide for your family, for retirement, your kids’ education, for charities or whatever you desire. A lot of people put off investing in property until very late in their years and wonder why they couldn’t get ahead. Once you understand the basics, the actual yearly cost of holding a property is quite small – in fact, if you have some equity, you can buy properties now that will be positive cash flow and put more money in your pocket. Don’t let money burn a hole in your pocket – Pick a sound property strategy and when you add the tax depreciation benefits you’ll have a great recipe for wealth accumulation. If you would like to get your home buying or investment property plans on track, please call us on 1300 655 615 or email your wishlist to discuss your requirements to start the conversation about your requirements and goals. I am very pleased to introduce Phil Clifford as the newest member of our team at propertybuyer. Philip has several decades of experience and knowledge and competent in all classes of property whether Commercial, Industrial, Residential or Englobo land for development purposes. Acquisition and site amalgamation are his specialty with experience both in the private and public sectors. Philip holds a Masters in Property Development from UTS Sydney and is a Licensed Real Estate and Business agent, Strata manager and registered valuer. Philip specialises in the Illawarra/ Wollongong area and loves to serve his clients with passion and respect, utilizing his broad network of contacts and always assuring the most ethical and confidential service. Integrity-driven, reliable and highly productive Philip would a great buyers’ agent to have on your side. If you are interested in buying a home or investment property in the Wollongong / Illawarra area, please call us on 1300 655 615 or click here to email us your wish list today.